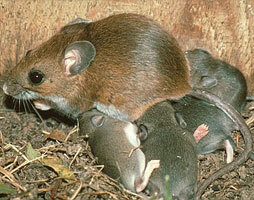 House Mice become sexually mature between 8-12 weeks of age. Producing a litter of 5-6 young who will then at 8-12 weeks will start to reproduce. House Mice are good climbers and can climb vertical walls and rough surfaces. 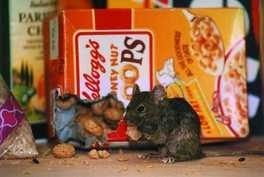 The House Mouse can exsit on very little water and gets most of it's fluid from the moisture in what food it eats. They are indiscriminate in the choice of their food and can consume an astonishing variety of foods. The most important thing people should know about mice is the ability to transmit diseases to humans and livestock such as salmonella,parasites like ring worm,mites,fleas and ticks. They have also been known to spread foot and mouth in cattle and sheep. Financialy they can be devestating aswel. Chewing through electrical and telephone cables which can be costley to repair and if not noticed can then become a fire hazzard. Causing damage to you're possesions in you're house, especialy if they get into loft areas and eating insulation off water pipes and then chewing through the plastic water pipe that is commonaly used in modern day houses, causing leaks. Damaging stored food in buildings,warehouses and buildings that farmers use for storring crops or animal feeding. At the first signs of rodent activity call Duncan Ross Pest control who will come and erradicate the mouse problem for you before it becomes a serious problem.